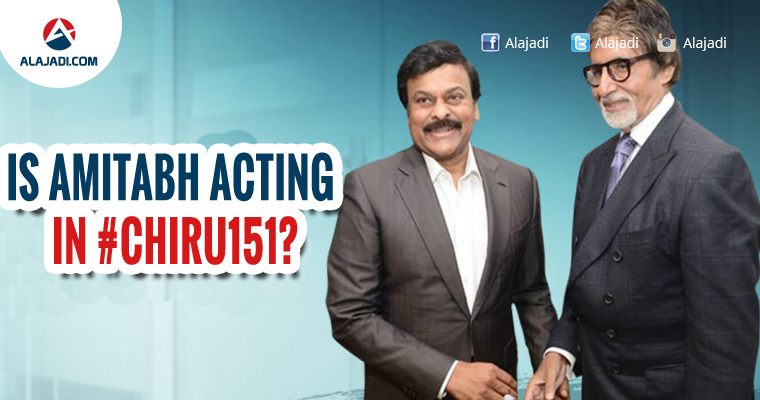 » Big B And Chiru Finally Come Together! Mega Star Chiranjeevi’s upcoming film, which is said to be based on the life of freedom fighter Uyyalawada Narsimha Reddy, is now the most talked about film in Telugu circles. The film, which is yet to be titled, will be officially launched in August this year which is being directed by Surender Reddy. The film will have Chiranjeevi play the role of the freedom fighter himself and the Mega Star is preparing get into the shape of the character. The film will be produced by Chiranjeevi’s son Ram Charan under their home banner Konidela Productions. The latest buzz around the film is that Bollywood Super Star Amitabh Bachchan has been approached for a pivotal role in the film. Rumours are doing rounds in Telugu film circles that Amitabh Bachchan has given his nod to act in this film and the further discussions are in progress currently. These reports are yet to be confirmed though since the makers of the film haven’t yet confirmed the news. Except for Chiranjeevi and Nayanthara, the rest of the case if yet to be confirmed by the makers of this film, which will be the 151st film of Chiranjeevi. Earlier, there were rumours that Bollywood gorgeous lady Aishwarya Rai was approached to play the female lead role for which the actress had quoted a hefty amount. The actress later denied all these rumours and said that she was only given an overview of the film and hasn’t had any discussion about the script of the film.